Four Women was found by the Massachusetts Department of Public Health to be in violation of laws concerning medical waste management, including failure to maintain medical waste record-keeping log and failure to maintain written contingency plan for spills and accidents --Four Women connected with Merrimack Valley Women’s Healthin Haverhill, MA alternate address: 152 Emory St Lynn Borgatta formerly an abortionist at this clinic. Marcus Gordon does abortions here on Thursdays and Saturdays, and in Natick on Tuesdays. Four Women -- 2002-2003 MA Dept. of Health waivers - See page 8. Dept. 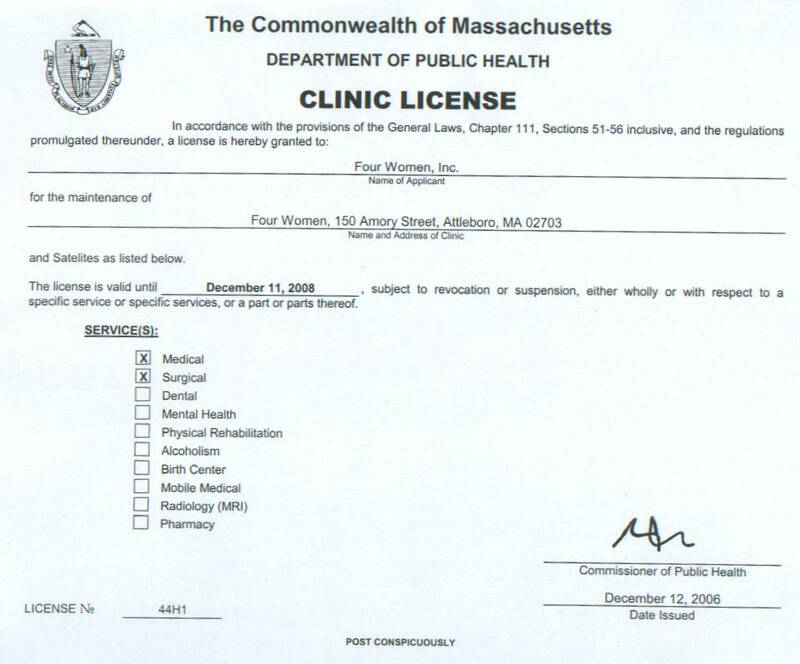 of Public Health license for Four Women abortion clinic in Attleboro, MA. License valid through 06-14-2011. April 21, 2009: Four Women pays a license renewal fee of $255 to the Commonwealth (state) of Massachusetts. Dept. 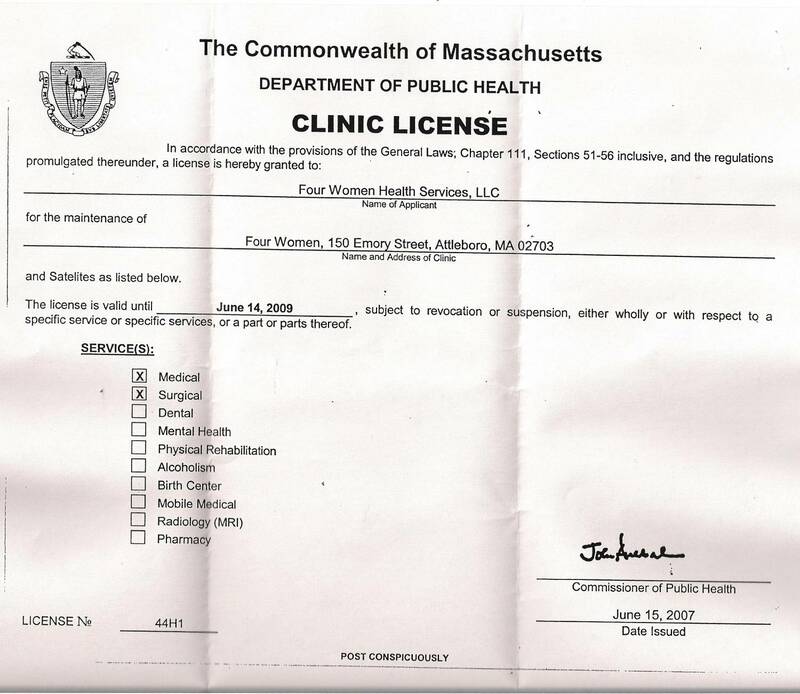 of Public Health license for Four Women abortion clinic in Attleboro, MA. License valid through 06-14-2009. Dept. 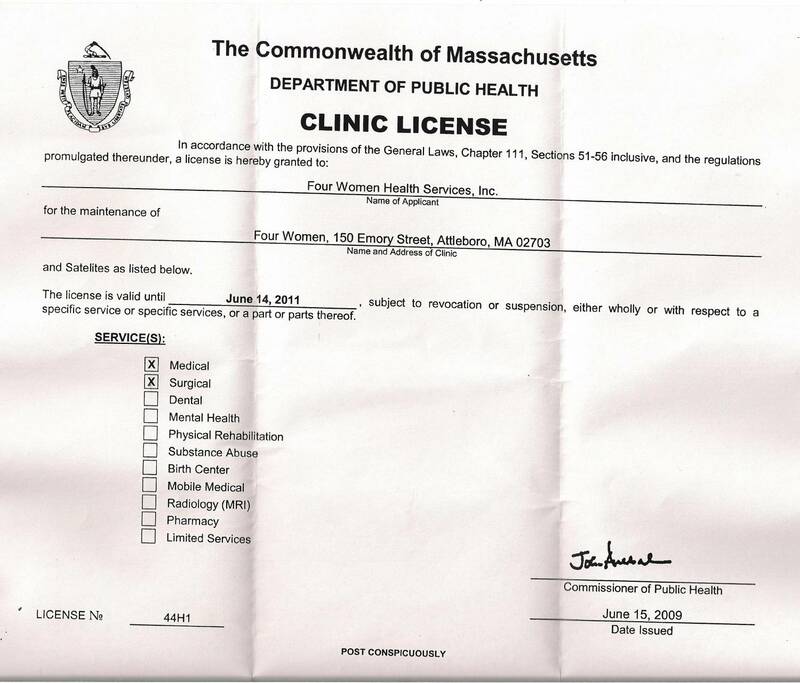 of Public Health license for Four Women abortion clinic in Attleboro, MA. License valid through 12-11-2008. License applications for the nurse. Four Women lab has a repeat history of non-compliance; proposed sanctions due to unsuccessful participation in proficiency. List of Massachusetts corporations owned/run by abortionist Marcus Gordon, including multiple abortion clinics. Application to MA Dept. 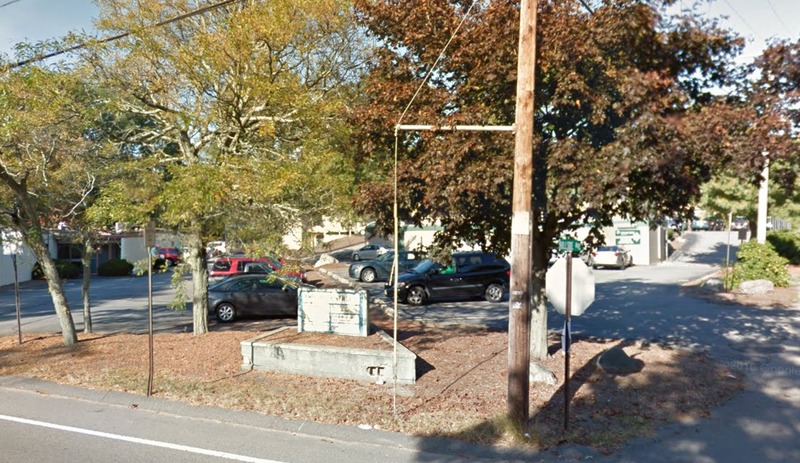 of Public Health for abortion clinic expansion for Four Women abortion clinic in Attleboro, MA. Complaint against abortion nurse Christie Jurena. Illegal disposal of biological waste and medical waste. Four Women voluntarily ceased RH testing. Fire Dept inspection certificate for Four Women Health Services abortion clinic.